This the area for Manual and Automated Tablet Hardness Testing Products. Please read more next to the images for more information about performance, accessoires, calibration tools and consumables. The Fully WHT3ME fully automated tablet testing Instruments are designed to automatically measure 4 parameters for either round or odd shaped tablet forms. These parameters are: Weight, Height, Diameter (or Length) and Hardness. The WHT3ME has a special system in the length / hardness section (sample orientation flaps) which can move an oblong tablet (for example) into the correct orientation for length and then hardness testing regardless of the angle at which it arrives at the measuring point. Using the WHTSM or WHTSM1 multiple batches of tablets can be tested fully automatically. The PT-MT3 instrument, the new Magentic Tablet with built-in calibrated load cell, is used to qualify and calibrate the maximum hardness result detection and speed/force increase rate of most Tablet Hardness Test Instruments in the field. The WHTME series of automated tablet testing Instruments is designed to automatically measure four parameters for either round or odd shaped tablet forms. These parameters are: Weight, Height, Diameter (or Length) and Hardness. The WHT3ME has a special system in the length / hardness section (sample orientation flaps) which can move an oblong tablet (for example) into the correct orientation for length and then hardness testing regardless of the angle at which it arrives at the measuring point. The carousel design which holds up to 20 tablets allows the use of the WHT3ME without any multiple batch feeding system. Two different Batch Feeder Systems are available for auto transport of samples directly into the WHT3ME Testing System, a single Batch Feeder WHTSM1 or a 10 Batch Feeder WHTSM. 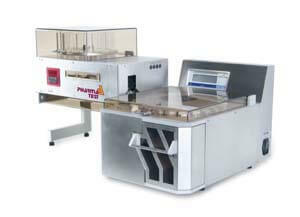 The 2 instruments, Feeder and Testing System, are not connected to each other to avoid vibration transfer, which means higher throughput and to ease the cleaning of both units. The system control is provided by an external PC. All systems are supplied with the WHT32 Software package which allows full documentation of the results, with special banding showing acceptable and non-acceptable product tolerances. The software package is available as a fully 21 CFR Part 11 compliant version. The PT-MT3 Magnetic Tablet, is the sucsessor of the PT-MT2 used to qualify and calibrate correct hardness detection and force/speed increase rate of most Hardness Test Instruments, like PTB 311E/511E, PTB 411/411-500, PTB 301/302/501/502/320, PTBA211E, WHT and WHTME, 4M, 8M series. Similar to the breaking behaviour of a tablet or ampoule the test jaw “breaks” when a selected force is applied to the test handle in which a calibrated load cell is placed. 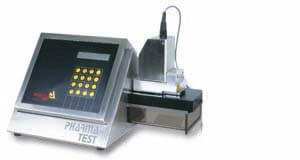 Any test range can be selected within the range of 10 to 500N. In order to use the instrument for all PHARMA TEST and other make Hardness Test Instruments special instrument adaptors (supports) are available. The PT-MT3 is calibrated using certified weights.